Professional processing: The LUMIX DMC-GH4 has a new Venus Engine image processor, which dramatically boosts sensitivity, gradation performance, resolution, and colour reproduction. Superior noise reduction systems including a new Random Filter for noise reduction have also been included, enabling fantastic results even in low light and at the maximum ISO level of 25600. A new quad-core CPU ensures the camera can achieve the high speed signal processing that is required for rich video recording in 4K, while resolution has been improved by applying a newly designed processing routine, which allows natural edge processing to subtly render details, such as hair, extremely accurately. The speed to capture the unexpected: The speed of the LUMIX DMC-GH4s burst shooting is dramatically improved boasting 12 FPS at full resolution to capture even the fastest moving subjects in perfect focus. The LUMIX DMC-GH4s shutter speed up to a maximum of 1/8000 second enables not users only to capture spur-of-the-moment shots of fast-moving subjects, but also to use high speed lenses with open aperture for impressive defocus effects. In addition, both built-in and external flash can be synchronised, with maximum 1/250 second shutter speed. The highest quality shooting experience, in 4K: A key advancement in the LUMIX GH4 is the addition of 4K video recording in MOV/MP4, enabling videographers to realise their creative visions in Ultra HD resolution. The LUMIX GH4 is also capable of Full HD video with ultra-high bitrate at 200 Mbps (ALL-Intra) or 100 Mbps (IPB). Wide connectivity options for easy sharing in the field: The LUMIX DMC-GH4 integrates Wi-Fi connectivity with NFC technology to offer the most flexible shooting experience as well as instant image sharing, even when youre in the field. In addition, users can remotely shoot both still images and video with a smartphone or tablet, as well as adjust zoom, focus, aperture and exposure. For smartphones or tablets without NFC, the camera will display a dedicated QR code on its monitor to easily pair the devices. Re-engineered for optimum image quality Professional processing: The LUMIX DMC-GH4 has a new Venus Engine image processor, which dramatically boosts sensitivity, gradation performance, resolution, and colour reproduction. Superior noise reduction systems including a new Random Filter for noise reduction have also been included, enabling fantastic results even in low light and at the maximum ISO level of 25600. A new quad-core CPU ensures the camera can achieve the high speed signal processing that is required for rich video recording in 4K, while resolution has been improved by applying a newly designed processing routine, which allows natural edge processing to subtly render details, such as hair, extremely accurately. High speed, high precision shooting For professional and enthusiast photographers and videographers alike, precision control and speed are paramount. With the LUMIX DMC-GH4, Panasonic has further developed the renowned quality of the LUMIX G series AF systems, achieving ultra-precise results in even the most challenging and quickly developing situations: The speed to capture the unexpected: The speed of the LUMIX DMC-GH4s burst shooting is dramatically improved boasting 12 FPS at full resolution to capture even the fastest moving subjects in perfect focus. The LUMIX DMC-GH4s shutter speed up to a maximum of 1/8000 second enables not users only to capture spur-of-the-moment shots of fast-moving subjects, but also to use high speed lenses with open aperture for impressive defocus effects. In addition, both built-in and external flash can be synchronised, with maximum 1/250 second shutter speed. Immersive, cinematic and versatile videography, in stunning 4K With the LUMIX DMC-GH4, Panasonic has removed the gap between consumer and professional video cameras. The additional benefit of 4K recording in various formats and frequencies enables videographers to create stunningly immersive and realistic cinematic worlds, full of detail and true colour. 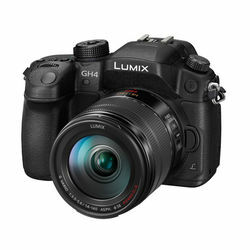 At the same time, the professional and versatile recording capability will suit every kind of production site and shoot: The highest quality shooting experience, in 4K: A key advancement in the LUMIX GH4 is the addition of 4K video recording in MOV/MP4, enabling videographers to realise their creative visions in Ultra HD resolution. The LUMIX GH4 is also capable of Full HD video with ultra-high bitrate at 200 Mbps (ALL-Intra) or 100 Mbps (IPB). High resolution, high response displays: The LUMIX DMC-GH4 boasts two newly developed high precision, high speed OLED displays for both the LVF (Live View Finder) and rear monitor. Increasing the resolution of the viewfinder to 2,359K dots and redesigning its optics, the LUMIX DMC-GH4s LVF offers a 1.34x / 0.67x (35 mm camera equivalent) magnification and 100 % field of view. Furthermore the 3.0-inch 1,040K-dot free-angle static touch control OLED rear monitor (3:2 aspect) has a wide-viewing angle and rotates 180° to the side and tilts 270° up and down Wide connectivity options for easy sharing in the field: The LUMIX DMC-GH4 integrates Wi-Fi connectivity with NFC technology to offer the most flexible shooting experience as well as instant image sharing, even when youre in the field. In addition, users can remotely shoot both still images and video with a smartphone or tablet, as well as adjust zoom, focus, aperture and exposure. For smartphones or tablets without NFC, the camera will display a dedicated QR code on its monitor to easily pair the devices. Lens LUMIX G VARIO 14-140mm / F3.5-5.6 ASPH. / POWER O.I.S.